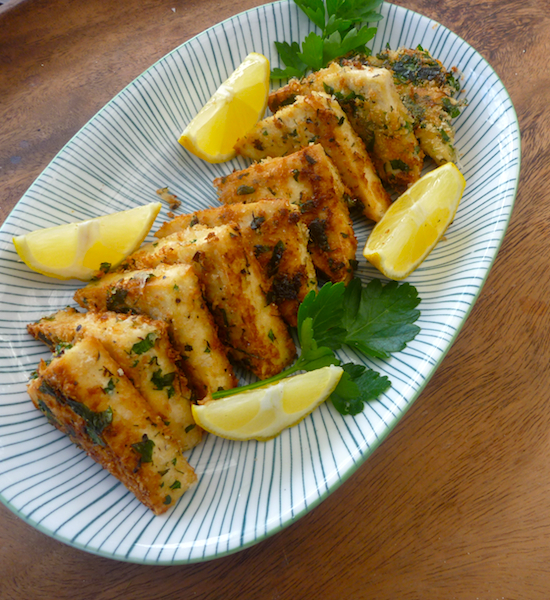 I was a bit dubious when I first made these herb crusted tofu triangles; I didn’t think they would work with the tofu flavoured only by the herb crust. It sounded a bit ‘Blandsville’, but somehow, it does work and the herby, cheesy crust makes a wonderful, textural contrast with the tofu. Plus they make the best sangers. 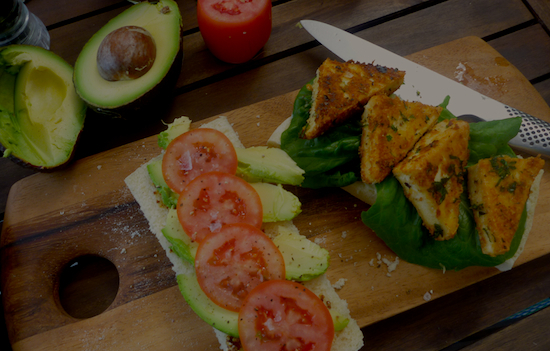 Fry up some herb crusted tofu triangles and build your perfect schnitzel sandwich. I got some fresh focaccia from the Haberfield bakery (the best Italian bread in Sydney), started with lashings of mayonnaise, lettuce, avocado (of course), tomato, and some seeded Dijon mustard. Voila! It looked like one of those chicken schnitzel subs from the deli (well, kind of). Anyway, it’s certainly up there with the best of best vegetarian sandwiches. You really can’t go wrong with fried crumbed stuff on a sandwich – it’s bound to be brilliant. 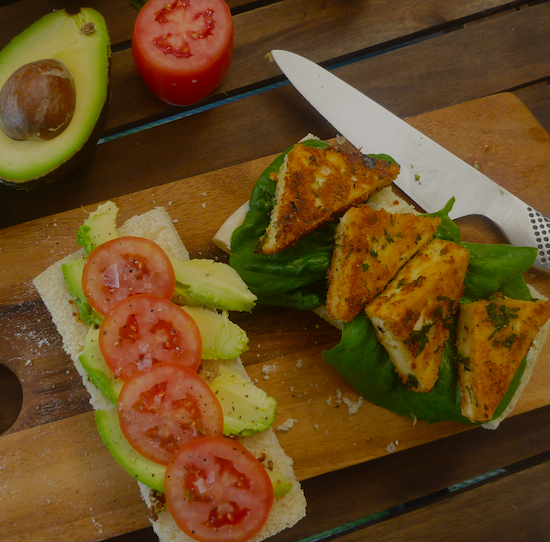 Slice tofu into slices about 1 cm (⅓ inch) thick. Cut into squares and then triangles, pat dry and drain on paper towels. Combine breadcrumbs, cheese, herbs, pepper and salt in a shallow dish. Dip tofu in egg then into crumb mix. Heat oil in fry pan. When hot, fry tofu on both sides on medium heat until golden brown and crunchy, for about 10–12 minutes. That sounds amazing! I did used to love schnitzel back in the day and haven’t tried making a vego version, so thanks for sharing! I think this is fairly easy to veganise, I’d add some sesame seeds or ground nuts to the bread crumbs. I’m not sure what you’d use in place of the egg to get it stick to the tofu though.